We have the following items available for rent. Click the thumbnail for a larger image. Download the contract on the How it Works link to reserve. 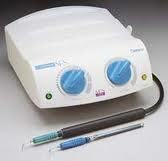 Dentsply Cavitron SPS Scalers just as pictured here.